This morning I attended a woman’s entrepreneur conference, the theme of which was thinking outside the box. A large number of these strong independent and well put together women came to talk to me about stress reduction, being stuck in certain areas of their lives. So I hope the first thing this article does is normalize the process that even the most dynamic go getters out there get stuck in some parts of their life. 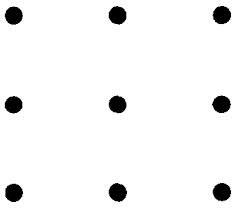 Given a few minutes to talk on mic, I presented the now famous nine dot problem and asked for someone to volunteer to connect all nine dots with only four lines without lifting the pen. An elderly asian man stepped up (I kind of cornered him into it) and tried unsuccessfully to solve the assignment. To be fair I don’t think he understood the instructions. Nonetheless, this is a standard exercise I show classes in order to get them understanding that what we think we perceive as reality is really just a conditioned state of mind and in order to change that, we have to be willing to think outside the box, with the box being simply our existing way of looking at things. So before you scroll down, see if you can follow those instructions and connect all nine dots drawing four lines without lifting the pen. The general point here is that we don’t see the world the way it is, we see the world the way we are. Sitting with the actual goals we might have to find a solution might work if we observe long enough to stop using the same methods that haven’t worked in so many situations. Reacting in anger, irritation, fear, anxiety, frustration, all of these emotions may initially be useful in identifying where a problem might be, but after that identification, how can we resolve a situation instead of reacting to it. The more we look at the pain (or) the area of stress in our lives, the more we understand it, the more we move from gross to subtle understanding of it in a way that helps us to work with it or hold it in a new way. Giving ourself space, practicing that space, gives us permission to color outside the lines to find new solutions that don’t fit inside the box. How can you think outside the box today? Instead of pushing, relax for a bit, instead of pulling, let go, let be, observe the dynamic and figure out a way to expansively flow around, through, or with the problem.